Want to improve your mile time? We’ve got 5 actionable tips to help you bring the HEAT. Hoping to leave your competition in the dust? I feel you. 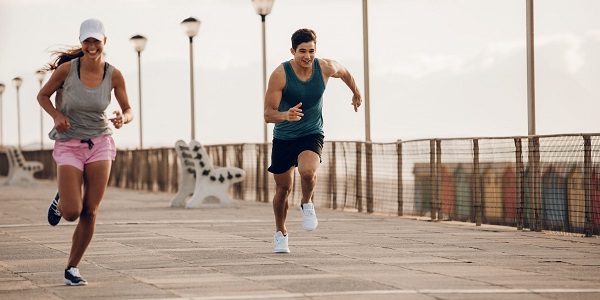 Check out the tips below to help you run your fastest mile. TLDR? Scroll down to our quick tips video and take it all in quickly (look at you, speeding through things already). Rather than saying, ‘I just want to run faster’ and hoping for the best, set a realistic goal. Set your goal pace based on your current pace to find out how much faster you need to run. And remember, you go-getter, you, ramping up too quickly can lead to injury. And that’s totally not the goal here. If you’re a solo runner hoping to become a much speedier solo runner, it might be time to partner up. I know, I know, you don’t want to deal with the incessant chatter of your morning runner friend who almost always drinks too much coffee. But if you want someone to help you push your pace, running with someone who’s faster than you can help improve your time. Bonus: Chatty runner friend can distract you from that burning feeling in your quads as you power up your neighborhood hills. Hill running can help you fly on the flats. Not into lifting weights? You’ll grow to love it when you see how much your running improves. Seriously. Increasing your overall strength will help increase your speed and endurance. Check out these strength training workouts to get started. Unroll your poor, neglected yoga mat and start getting your stretch on. Your tight, angry muscles will thank you and your next run will feel far less laborious. Did you know tight groin muscles = shorter stride length? Yikes. That’s where stretching comes in. When stretching, don’t forget about your friend and mine, the hip flexor. Ignoring your hip flexors can lead to a world of hurt. If you want to take it to the next level, because that’s just the kind of person you are (we like it! ), incorporate foam rolling. Your muscles will thank you. Finally, if you’re stretching but not seeing results, mix it up and try this alternative to stretching. With more endurance, you’ll be able to hold a faster pace longer. That’s where long runs come in. So get ready to tack on the miles. As you incorporate long runs and up your weekly mileage, be sure to take it slow to avoid injury. Need some motivation to help push you through the longer runs? We’ve got your back. Check out this list of the Top 100 Running Songs. Check out this video and if you’re feeling friendly, share it with a running buddy (sharing is caring).